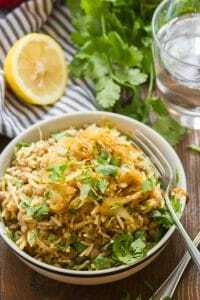 Lebanese spiced lentils and basmati rice are tossed with caramelized onions and fresh cilantro to make this flavor-packed mujadara. Delicious as a main dish or a show-stopping side! Can I get a little gross for a few minutes? I know, this site is about food, and my husband shakes his head every time I mention something remotely gross. Once again, I’m going to whine about summer. This time it’s the wildlife that’s got me down. Don’t get me wrong: I love animals. I don’t eat them. I’m just not into nature in my home. And nature has been in my home a lot lately. Saturday morning we awoke, pondering, is that wasp trying to get in through the window, or out through the window? It was trying to get out. I still freak out a bit in the presence of stinging insects (understandably, I think). That wasn’t too bad, but later that day, around dinnertime, while seated at the kitchen table, a bat swooped in over our heads. A bat! This is actually the second time in my five years in this house that a bat’s gotten in, and I have no idea how they’re doing it. All of that was a minor annoyance. The gross part was the moths in the pantry. I opened the door and there they were, all fluttering away in my face. I pulled out clear plastic canister of rice, set it on the counter, and watched in awe as about a dozen moths popped out of the grains. They got into just about everything and I’m not even sure they’re gone yet. I looked all over the internet, hoping someone would have a simple solution, like sprinkling cinnamon in the cabinet to repel them. No such luck. Fortunately, this dish happened long before all of that. Mujadara is known for being a dish that can be constructed from pantry staples, but I don’t think I’ll be doing much with pantry staples for a while now. I made this months ago and held it back, thinking it wasn’t much of a warm weather dish. Today seemed appropriate, since I’ve officially decided I’ve had it with summer. I’d actually encourage you to enjoy this stuff any time of year. It’s incredibly delicious, and super easy, despite the long cooking time, which is mostly passive. Most of the long cook time is attributable to caramelizing the onions. It does take a while, but you don’t have to do much other than give them a stir every so often. I know the temptation can be strong to crank up the heat and rush through the caramelization process, but don’t do it! Let them cook away under low heat and after about an hour until they’re super soft and golden brown. It’s so worth it! Cook some lentils while the onions caramelize, or take a shortcut and use canned lentils if you can find them (my supermarkets are always hit or miss with this!). 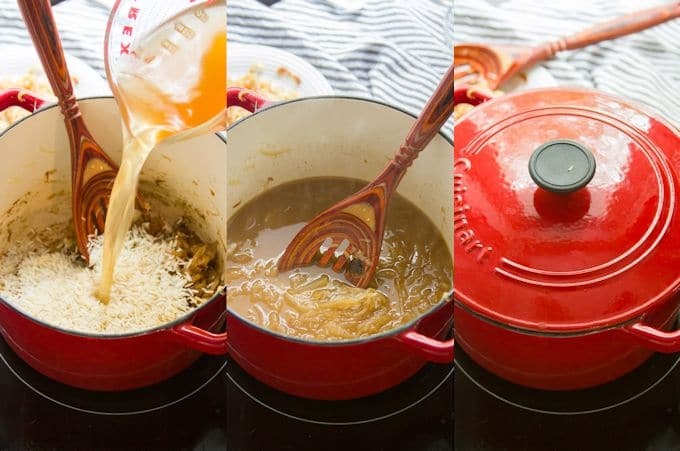 Once the onions are caramelized, you’ll take some of them out of the pot for topping your mujadara once it’s done. Add rice, spices and broth to the pot, bring everything to a simmer, and cover it up. Twenty minutes later your rice should be perfectly cooked. Stir in the lentils and cilantro. 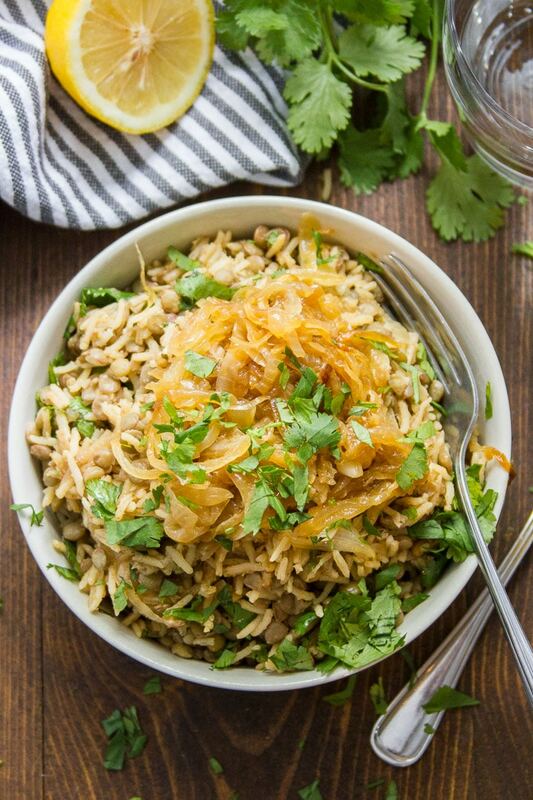 Serve your mujadara topped with the extra caramelized onions you held on to! Most of the cook time is devoted to caramelizing your onions. If you want to cut down on that, cook them ahead of time (make a big batch so you can use them for multiple dishes!). Refrigerate them for 3-4 days, or freeze them using one of these genius methods. Can you substitute different types of lentils? Yes you can! Just keep in mind that the cook time may vary. And I don’t recommend using split red lentils because they cook up so soft and you might end up with mujadara mush! Can you use a different variety of rice? 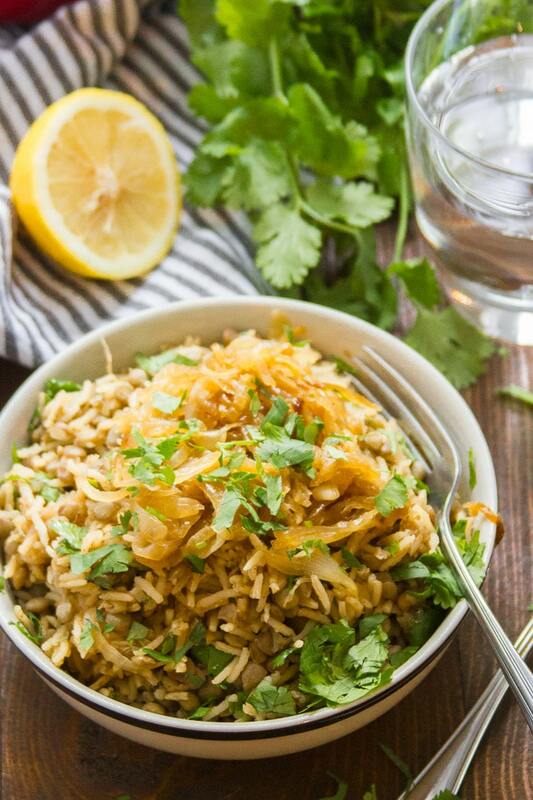 Yes, but the flavor and texture of basmati is perfect in this dish. I highly recommend using it if you can. You might also need to adjust the amount of vegetable broth and cook time if you switch things up — refer to the cooking instructions for your rice. What if I hate cilantro? Try subbing parsley! Place the oil and onions into a medium saucepan. Toss a few times to coat the onions and place the pot over medium low heat. Allow the onions to cook for 45 to 60 minutes, until they're caramelized and slightly browned. While the onions cook, place the lentils in medium saucepan. Cover them with water and place the pot over high heat. Bring the water to a boil, lower the heat and allow it to simmer for until the lentils are tender (about 20 minutes for brown lentils, 40 for green). Remove the pot from heat and drain the lentils into a colander. Set them aside. 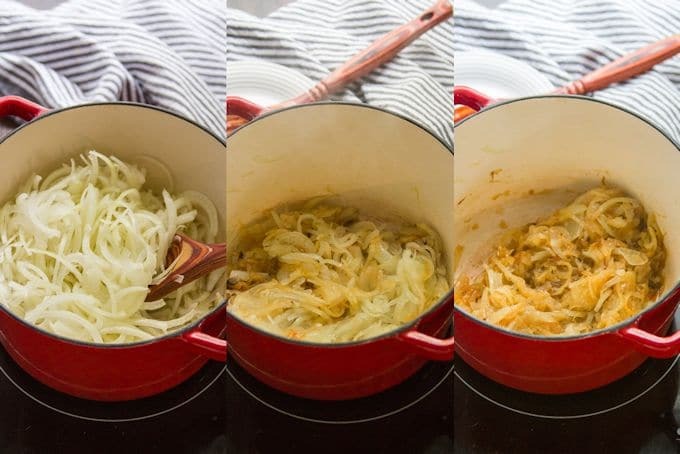 When the onions have finished caramelizing, remove half of them from the pot and transfer them to a plate. Raise the heat beneath the onions to medium, add the garlic, and cook 1 minute more, until very fragrant. Stir in the rice, vegetable broth, cumin, cinnamon, and cayenne. Bring the liquid to a boil, lower the heat and cover. Allow the mixture to simmer until the rice is cooked and liquid is absorbed, 15-20 minutes. Remove the pot from heat and allow it to sit for 5 minutes. 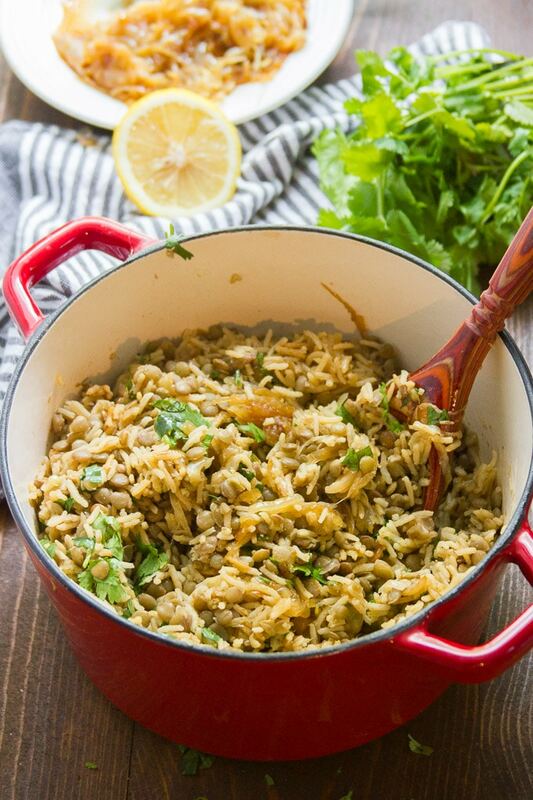 Stir the lentils, lemon juice and cilantro into the pot with the rice. Season with salt, pepper and lemon juice. 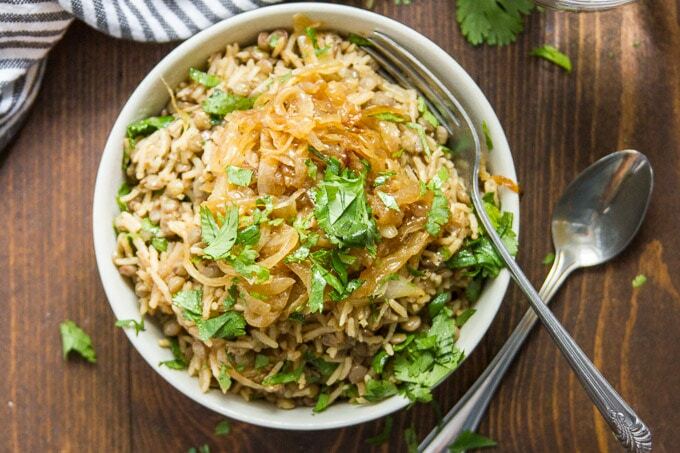 Divide the mujadara onto plates and top with the reserved caramelized onions. Serve with lemon wedges. Could the rice amount be cutback by half? I am diabetic so tend to stay away from rice as a general rule. This looks like a wonderful recipe. I am thinking that would be freezable too…husband probably won’t try it but he might surprise me and like it! Thanks for posting this. I think so, though you might want to add the spices at the end so you can adjust if needed. You could also try swapping out the rice with cauliflower rice. Here’s a post on how to prepare basic cauliflower rice, in case you aren’t familiar. Enjoy! Euch – hate moths. We have clothes moths and they’re a nightmare to get rid of. I got some magic stuff from a Bulgarian cleaner that seems to keep the numbers down but we still get some. So if you have any Eastern European connections that’s the way to go, nothing I found in the shops here seemed to really work. 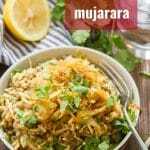 Your Mujadara sounds great – I love Middle-Eastern food. Must try this. That seems so surreal to me, just opening a container and having moths flying out of it! I never heard of these until now. It looks like a lot online sources suggest pretty much emptying pantries, vacuuming, washing it out with vinegar, and laying out bay leaves. Just made this tonight for dinner and I loved it and have plenty leftover! Will make again! This is a good one for getting a few days worth of meals. :) Glad you enjoyed it! Thanks Leslie! I had a lentil salad this spring that incorporated preserved lemons throughout – they added a wonderful layer of flavor. Thought of it since this recipe uses lemon juice. Wonder how that would be? I’ve wanted to make preserved lemons since then! It’s been a while since you originally posted, I hope the moths have stayed away! I get them when I have old pasta or grains in the cabinet – it seems the larva are in the glue of the boxes, iirc. Giving the cabinets a thorough clean-out does the trick. That sounds delicious! I’ve been wanting to try making preserved lemons forever. :) And YES! Thankfully, I scrubbed and scrubbed and had to throw out a bunch of things and seal everything else up, and it took forever, but it’s been months since I’ve seen a moth in the kitchen. I can’t say as I like cinnamon in savory dishes so not sure about this but the rest of the combo sounds great. As for moths, you’ll need to seal everything in your pantry. Flour, any mixes whether rice or cake or whatever. Noodles, everything. Seal each unit off or type of unit. YOu’ll probably have to do this for a year or so. I lost almost 50 pounds of flour due to one item coming in contaminated. If you buy bulk items especially seal them off. They get contaminated more easily since they sit in the store in unsealed bins. Good luck. It’s not fun. (Oh, seal of any cereals too – anything not in a can or jar! It happened to me at Thanksgiving with company in the house. They were not impressed! We finally got rid of the moths, and it took forever! I did like you said and sealed everything up and cleaned the pantry obsessively. It did take about a year and we lost so much food. :( But thankfully, at this point it’s been a while since I’ve found any sign of moths. So glad you re-posted this! I used a different recipe when I made this a month ago and it was bland. Definitely going to give this one a try. If you’ve never made this dish–trust me, it is so much more glorious than the sum of its parts! Delicious! This was a staple almost every holiday and a great warm bowl during colder weather. This is pretty close to my moms, so props to you. Delicious and a pot on the stove as I type. My recipe, learned from Lebanese family members, only uses salt as seasoning with the fried till crisp onions. This sounds like a tasty more spicy version of the dish my children and father used to cover with ketchup. The side dish I usually serve with mjudra is salata malfouf (cabbage slaw seasoned with garlic-lemon-olive oil dressing). This was SO good. The only difference was that we added cooked green cabbage and topped it off with a bit of Braggs. Love Braggs! 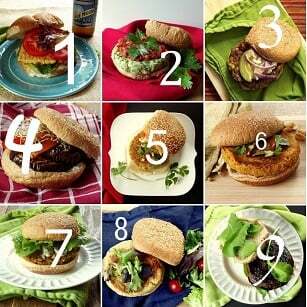 Loved this recipe!! Thank You! Sounds delicious!! I’m so glad you enjoyed it!